TROJAN Golf Cart, Gem Car, Ford Think & Utility Vehicle Batteries. TROJAN RENEWABLE ENERGY BATTERIES FREE DELIVERY TO MOST LOCATIONS IN THE LOWER 48. These are the very latest products added to our site. You can find a wide range of products and much more. If you are a regular visitor, this is the very first place you want to visit. That way, you do not need to search through our products to find the very newest additions. Just stop by this section and you will be able to select your favourite products from our most recently added range. Trojan T-105 Battery Free Delivery to most locations in the lower 48 States*. 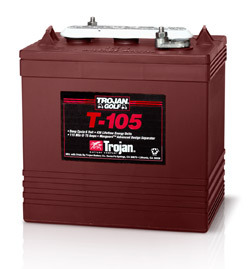 Trojan T-105 Golf Cart Battery Free Delivery to most locations in the lower 48 States*. Trojan T-105 Deep Cycle Battery Free Delivery to many locations in the Northeast. 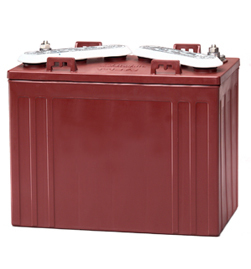 Trojan T-105 6 Volt Deep Cycle Battery Free Delivery to many locations in the Northeast. Trojan T-105RE Smart Carbon Deep Cycle Battery, Free Delivery to many locations in the Northeast. New Trojan T-105 6 Volt Deep Cycle Golf Cart Battery Free Delivery to many locations in the Northeast. Trojan T105-RE Deep Cycle Battery Free Delivery most location in the lower 48*. Trojan T-125 Golf Cart Battery free Delivery to most locations in the lower 48 States*. 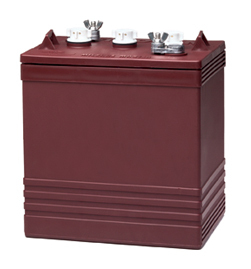 Trojan T-125 Deep Cycle Battery, Free Delivery to many locations in the Northeast. 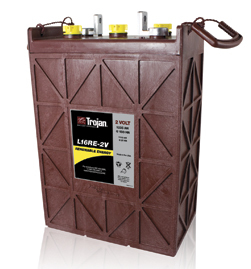 Trojan T-125 6 Volt Deep Cycle Battery, Free Delivery to many locations in the Northeast. Trojan T-145 Golf cart Battery Free Delivery to most locations in the lower 48 States. 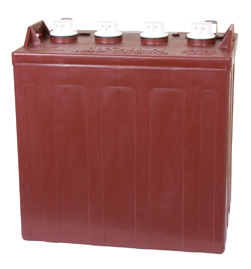 Trojan T-145 Deep Cycle Battery, Free Delivery to many locations in the Northeast. 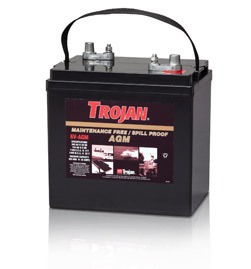 New Trojan T-145 6 Volt Deep Cycle Battery, Free Delivery to many locations in the Northeast. New Trojan T-145 6 Volt Deep Cycle Golf Cart Battery Free Delivery to many locations in the Northeast. 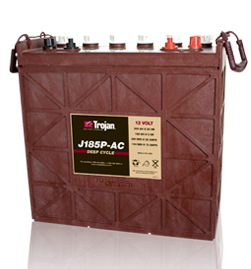 Trojan J185P-AC Deep Cycle Battery Free Delivery most locations in the lower 48*. 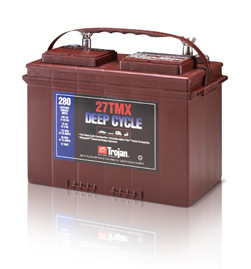 Trojan 27 TMX Deep Cycle Battery Free Delivery most locations in the lower 48*. Trojan 6V-AGM 6 Volt Battery Free Delivery most locations in the lower 48. 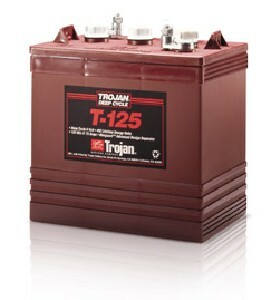 Trojan T1275 Deep Cycle Battery Free Delivery to many locations in the Northeast. Trojan SP RE 02 1255 AH Deep Cycle Battery Free Delivery most locations in the lower 48*. New Trojan T-875 8 Volt Deep Cycle Golf Cart Battery Free Delivery to many locations in the Northeast.